There have been some recent updates and articles on the appeal of the EPA’s Chesapeake Bay cleanup plan, brought forward by the American Farm Bureau Federation, et. al. Today’s post from the Chesapeake Bay Foundation gives a summary of the issue, and provides links to the amicus briefs filed for the upcoming case. The Washington Post also issued an article, listing entities involved with the cleanup plan, Maryland, Virginia, Delaware and the District of Columbia, as defenders of the cleanup plan. West Virginia has now joined with the American Farm Bureau Federation, while New York and Pennsylvania (where the case will be heard) have so far not spoken out for either side. According to the Post, twenty other states are opposed to the Chesapeake cleanup plan, and include Alabama, Alaska, Arkansas, Florida, Georgia, Indiana, Kansas, Kentucky, Louisiana, Michigan, Missouri, Montana, Nebraska, North Dakota, Oklahoma, South Carolina, South Dakota, Texas, Utah and Wyoming. However, various cities and organizations within these states have publicly defended the cleanup plan and the EPA’s authority to regulate pollution limits in the region. The case is scheduled to be heard this summer. Coming off of my post last Friday on fracking in Easter Virginia, I found this article from the Washington Post. One of the major suppliers to oil and gas companies will begin to list all of the chemicals used in the hydraulic fracking process. Many chemicals have previously been undisclosed by the oil and gas industry. If companies are more transparent about the chemicals being used in extracting natural gas, groups can test for these chemicals in watersheds, and potentially create new regulations for hydraulic fracking. As fracking is a possibility in the near future in the Chesapeake Bay region, (a degree of) transparency in the oil and gas industry will be necessary to protect water quality. This entry was posted in Energy&Environment and tagged Fracking. A Threat to Water Quality in Eastern Virginia? I’ve read a couple pieces this week about the possibility of natural gas drilling in Eastern Virginia in the near future. A Texas company that leases oil and gas rights has acquired 84,000 acres in the Northern Neck and Middle Peninsula, in the counties of Caroline, Essex, King George, King and Queen, and Westmoreland. The plans for oil drilling are not clear on the hydraulic fracking methods that will be used to extract the natural gas, according to a piece this week in the Richmond Times-Dispatch. Fracking has been a major concern for water quality in the nearby states of Pennsylvania, West Virginia and Ohio; chemicals from the extraction process can enter drinking water supplies, and impact human health. An editorial from the Virginian-Pilot, a newspaper out of Hampton Roads says fracking for natural gas could occur in the region in a years time. The natural gas in question lies in a shale formation called the Taylorsville Basin. 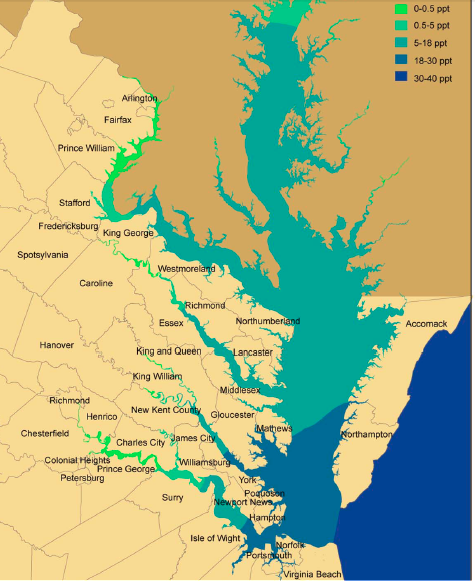 Aquifers above the basin lie in the Chesapeake Bay watershed, and support over 900,000 people in the area. Although natural gas is a cleaner burning fuel than other fossil fuel sources, the extraction process, as it exists today, can have negative impacts on water supplies, and could be a great risk to the health of the Chesapeake Bay, and to local residents, if fracking occurs as planned. This entry was posted in Energy&Environment, Virginia and tagged Fracking. Yesterday the Chesapeake Bay Program released their annual report on the abundance of underwater vegetation, and several news agencies have been sharing the results. I heard a piece on WAMU this morning on the Chesapeake Bay Program’s findings. In the 2012-2013 timeframe, underwater grasses increased by 24%, and up to 12,000 acres. Widgeon grass was the most successful in the middle Bay over this period, (between the Honga River to Pocomoke Sound), while eelgrass saw a smaller recovery. Widgeon grass and eelgrass are found in waters with higher salinity. As the Chesapeake has four different salinity zones, there are a variety of underwater grasses that grow in the bay. Grasses such as wild celery are found in the lower reaches of the Potomac River. Widgeon grass and eelgrass are found in the middle and lower bay. Underwater grasses are extremely important to aquatic species and the overall health of the Chesapeake. The grasses are a food source and offer habitat for the Blue Crab and several fish species. The long-term trend of seagrass decline was credited as a potential reason for the low crab abundance in recent years. Juvenile crabs are more susceptible to predators in areas where the seagrass has disappeared. Grasses also help to prevent erosion, and absorb nutrients in the water. Underwater seagrass is threatened by polluted runoff and a lack of sufficient light. The Virginia Institute of Marine Science (VIMS) does a lot of research on underwater grasses, and has been tracking their abundance in the bay for years. Their findings are included in the Chesapeake Bay Program report. The Chesapeake Bay Program had a piece today on the rising numbers of shad returning to the Potomac River. A return of native fish to the region can signify an improvement in water quality conditions. I shared news several weeks ago on the Chesapeake Bay Cleanup Plan, put forward by the EPA, which is being challenged by the American Farm Bureau Federation and other agricultural lobbyists. Just as a refresher, the American Farm Bureau et. al. is challenging the EPA’s ability to establish pollution limits and enforce related restoration efforts in the Chesapeake Bay. Most of the plantiffs are located west of the Chesapeake Bay watershed, and are not affected by standards set in this region. However, there are a lot of large scale agricultural groups challenging the Bay Cleanup Plan, as they fear legislation in the Chesapeake watershed could become a precedent in their own watersheds. Many actors in the Chesapeake Bay watershed have a very different outlook on the issue. Legislators have been working with various interest groups, including smaller scale agricultural groups, to set reasonable pollution limits. Organizations like the Chesapeake Bay Foundation has issued a petition against the outsider states that have been interfering in the Bay Cleanup Plan. State legislators in the Chesapeake watershed have stood with the Chesapeake Bay Cleanup Plan, most recently the Virginia Attorney General, Mark Herring. The attorney general filed a friend-of-the-court brief last Thursday, declaring that Virginia will defend the EPA’s regulatory abilities in the case of the Chesapeake Bay Cleanup Plan. (A link to the brief can be found at the Chesapeake Bay Foundation).